Oh my goodness, where do I start? 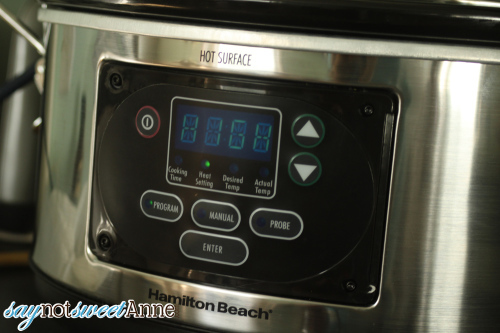 First off, I’ll tell you that Hamilton Beach sent me this amazing slow cooker a few weeks ago with hopes that I’d make something awesome in it. But of course, the opinions are all mine. I struggled for a bit because I’m not a food blogger and the things I use my slow cooker for (chili, soup, rump roast) are not glamorous or even remotely unique to me. And I don’t really aim to share things you’ve all seen before. 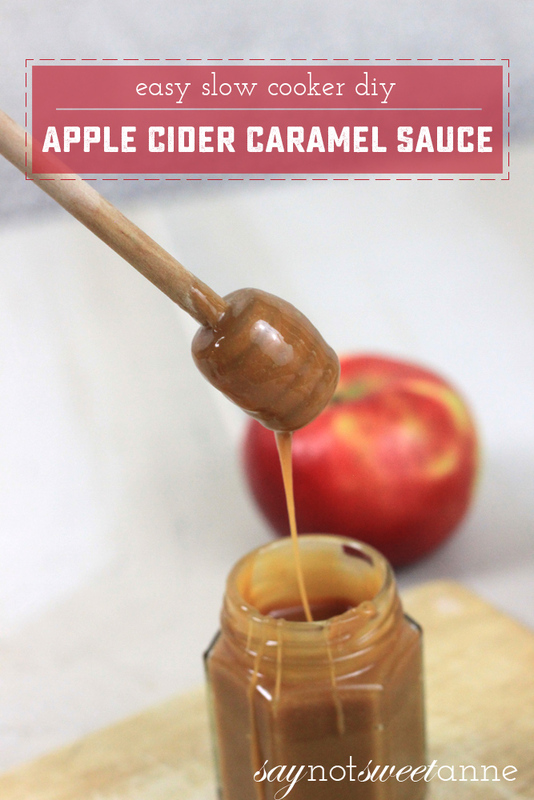 But as delicious as caramel sauce sounded, I wanted to up it a notch. 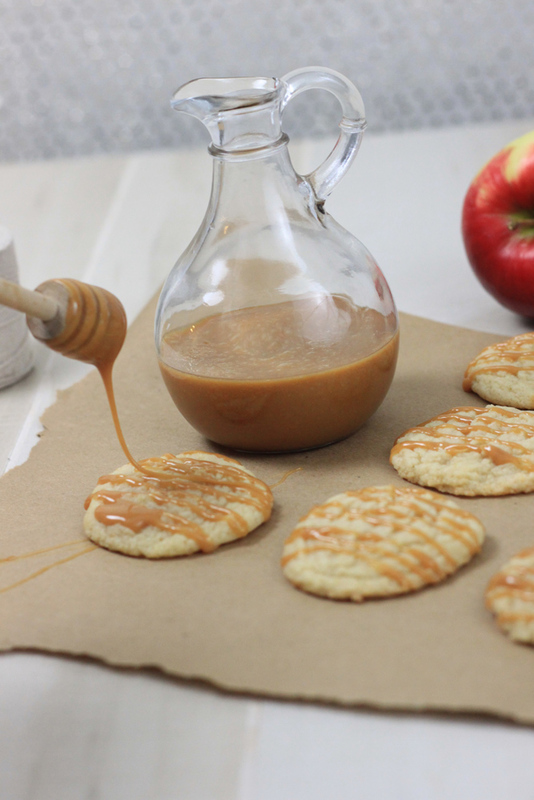 One of my favorite fall flavors is caramel apple (speaking of, have you checked out my caramel apple cookies? Or my list of 15 awesome apple recipes?) and this seemed like the perfect opportunity to marry the two in a sauce. It. Is. Amazing. Seriously- I burned myself several times sneaking spoons of the stuff before it had cooled. 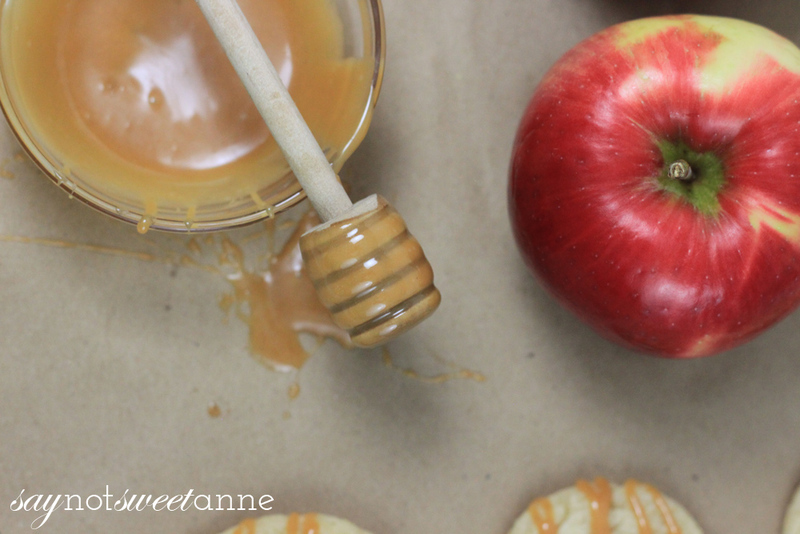 My whole house smelled like amazing caramel apple goodness and I even made donuts with them the following day. Slow Cooker and large glass bowl that fits inside with lid on. 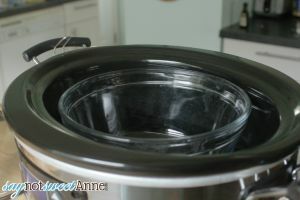 Make sure your slow cooker is big enough to accommodate a large glass bowl. 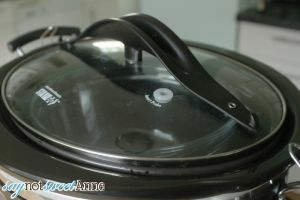 Test fit to ensure you can still put the lid on your slow cooker. 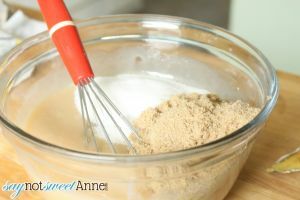 In your glass bowl, mix together everything but the lemon juice, apple cider mix and white and brown sugar. In a small bowl, dissolve the cider mix into your lemon juice. (I find microwaving the mixture for about 10 seconds at a time helps). 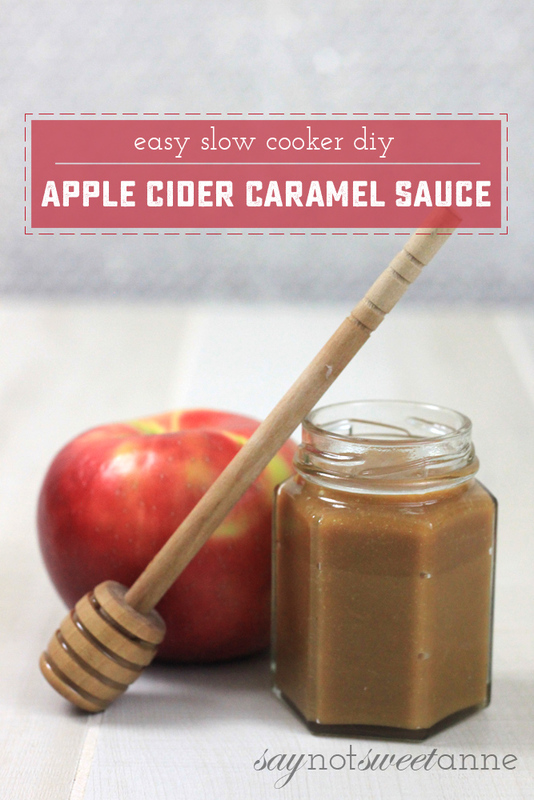 This will keep the cider from being grainy in your final product. I liked the intense apple flavor of 2 cider packets, but you could easily start with 1 and see how that feels. 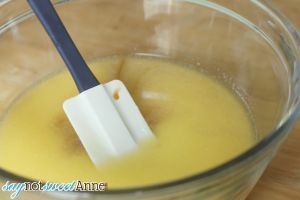 Add in the cider/lemon juice mix, and the sugars sugars and mix until everything is nice and evenly uniform. 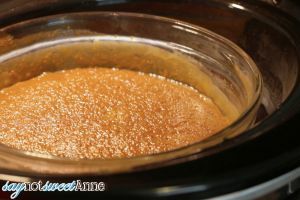 Place bowl of mixture in your slow cooker, and gently pour hot water around it until the water level is about even with the mixture level. (Water will evaporate a bit during the process). Cook on high (this can’t be done on low) with lid on for minimum of 4 hours. At 4 hours, stir the mixture (careful not to get any water in it) and taste. 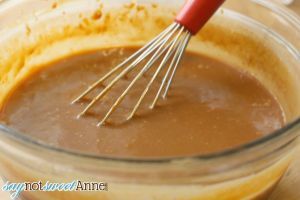 If you want a deeper caramel taste and a thicker texture, let cook another hour. Keep doing this until you reach your desired flavor and consistency. 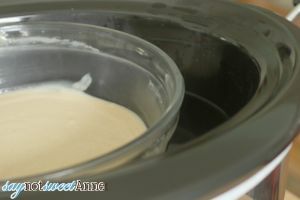 When finished, gently lift the bowl out of the slow cooker (water level should be low enough to allow this) and then whisk the mixture until it is uniform and silky. That’s it! 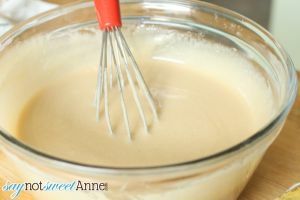 Pour into jars and wait for the sauce to cool, or use it right away over ice cream, apple pie, as apple dip, or on donuts! Kayla, this is soooooo good! I’m so glad that Mitch brought it to work today. I plan on making this soon!